‘State of the World’ is published by the Worldwatch Institute Europe every year and this year’s publication dives into the issues of sustainable cites. How can we make our cities better places to live? What does it take to make a city sustainable? Different cities face different challenges and there is no solution that fits all, but there are aspects that are crucial no matter what such as good city governance and citizen engagement. 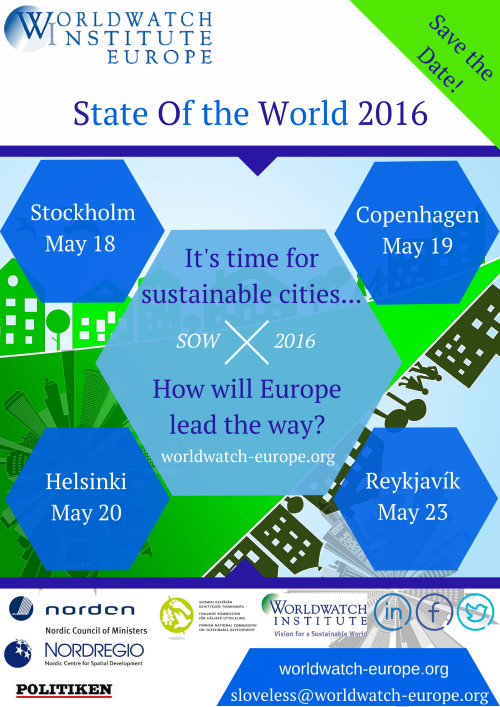 ‘The State of the World 2016 – Can a City be Sustainable ?’ will be presented in four Nordic capitals during May 2016 and Nordregio are pleased to announce that we will participate in these as speakers. We will highlight Nordic cases and initiatives as a contrast to the broader perspective in the report. For more information and registration, press the links below. 18 May: Stockholm HERE (at Fores) This event was filmed, watch it here! You can read the World Watch Institutes own summary of the event here. Information in Swedish about the event in Stockholm can be read on Fores’ website.